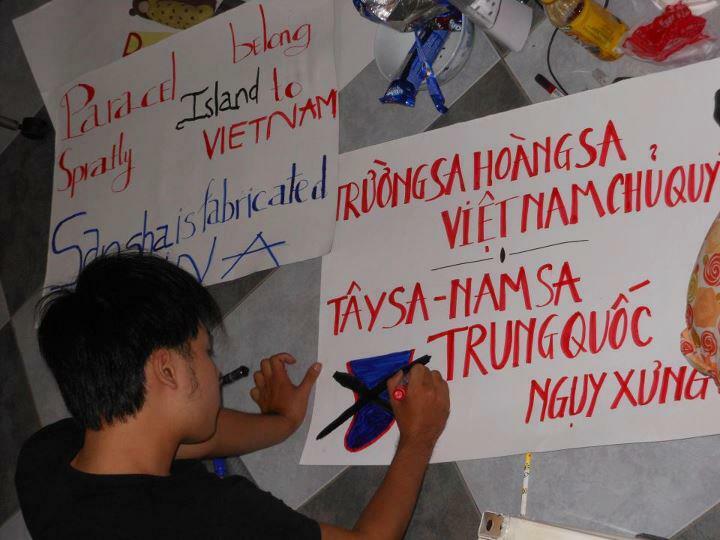 Word has been spreading that the people in Vietnam are ready to stage a major demonstration this Sunday to protest China’s latest act of aggression in the Southeast Asia Sea. The People’s Republic of China has recently offered bids to foreign oil companies to start operating in areas deep within Vietnam’s Exclusive Economic Zone. The Vietnamese government has declared these actions illegal, and in strict violation of Vietnam’s law and sovereignty. Beijing responded by claiming that what they are doing is “normal business activity” and warned Vietnam not to further escalate the situation. Hanoi cites UNCLOS as evidence against China’s “indisputable” claims of control over the entire Southeast Asia Sea, which Vietnam calls the East Sea. According to Vietnam, the nine offshore oil blocks that China plans to open to foreign firms is well within Vietnam’s EEZ, violating both international law and Vietnamese law. This dispute comes as part of a long standing tension building in the Southeast Asia Sea. After much silence and hesitation on this issue, Hanoi has finally raised its voice, prompting the country’s National Assembly to pass a law claiming official ownership of the Paracel and Spratly islands. These islands are prominently situated in the Southeast Asia Sea, and have been under Vietnam’s control since the Nguyen Dynasty in the 19th century. 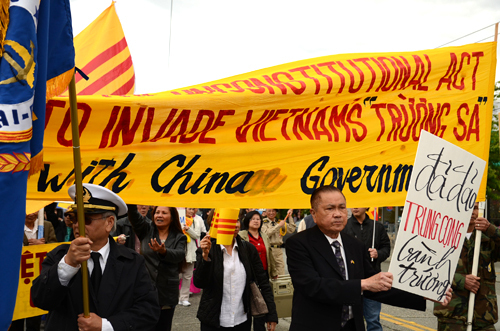 China disregards both Vietnam’s historical claims and its claims based on international law. The Asian giant continues to assert its claims over the sea in its entirety, putting the country into conflicts with its many neighbors. 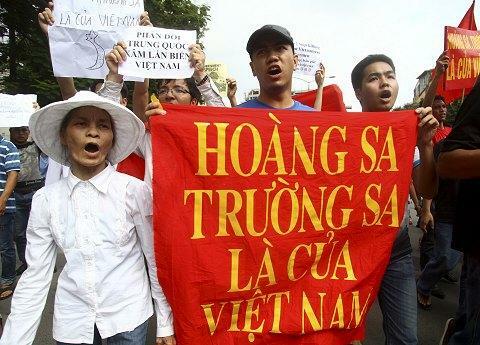 The people of Vietnam came out to protest Red China in the summer of 2011. The weekly demonstrations were permitted by the Vietnamese government for a while, but were formally and forcefully suppressed on the 11th week. In reaction to the assertions of Red China, the people of Vietnam have come together in preparation for the large demonstration slated for this Sunday. 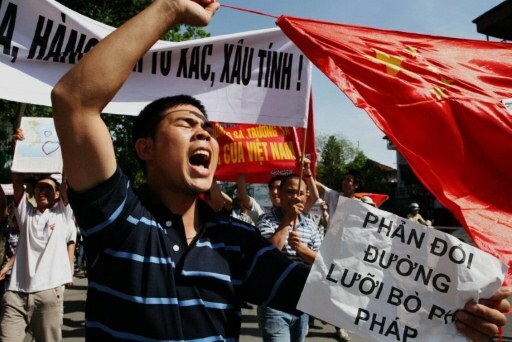 Protests are set to kick off in two of Vietnam’s major cities, Hanoi and Ho Chi Minh (Saigon). This is reminiscent of protests in Vietnam last summer, which were permitted by the government for a time before being forcibly subdued by Communist police. Though it is difficult to predict what the protests will yield, it will become clear on Sunday morning. For those of us who are outside of Vietnam, there is really not much we can physically do. However, it is important to let the Vietnamese within know that we support them, and that we are behind them in their efforts. Regardless of what country we are originally from or currently live in, Vietnamese everywhere are fighting for the same cause. To all the courageous Vietnamese coming out on Sunday, just know that we all support you. God bless. Fresh off the discussions and debate sparked by the previous post, it seems appropriate that we now discuss what is best for Vietnam’s future. First off, it is clear that the old Communist Party, along with their police state apparatus, must go. Whether it be from sweeping reforms throughout the Party, or a flat out ousting of the Party, the old Communist system does not work. The people of Vietnam need freedom, the freedom to express themselves, to share their ideas, and to openly disagree with their government. How do we attain this freedom? There are countless ways. However, regardless of how the people achieve the freedom they require, there are some fundamental principles that need to be present. The most important principle, and I’ve said this countless times, is for the people of Vietnam to be united. Only in unity can Vietnam overcome its many different obstacles. Unity has helped keep Vietnam alive through 4,000 years of Chinese invasion, and two centuries of western invasion. One cannot predict what all the factors will be in bringing change to Vietnam, that will only become clear when the time comes. However, one can rest assured that without unity, all other factors are insignificant. In order to defeat the two goliaths of the Vietnamese people, that is the VCP and the PRC, the people of Vietnam must stand together. As one unitary force, unfettered by fear or self-interest, the people of Vietnam will defeat these two enemies, to bring Vietnam into a new era of freedom and prosperity. This is what we call unity. Unity will be the factor that brings down the Vietnamese Communist Party when it becomes clear that they can no longer govern, when they are too confused and divided to further subjugate the people. Unity will then be the factor that helps Vietnam rebuild itself on the international stage, and realize its full potential as a righteous and prosperous nation. When push comes to shove, unity will then be the factor that pushes Vietnam to new heights in the face of Chinese aggression. In Vietnam’s history, unity has always been paramount, and that is something that will never change. It may seem odd to see a Jay-Z and Kanye West video posted on a blog like Freedom For Vietnam, but bare with me. This is Jay-Z and Kanye West featuring Frank Ocean, “No Church In The Wild”, off of Jay-Z and Kanye’s Watch the Throne album. The reason for the sharing of this video has less to do with lyrics, and more to do with the imagery. This video shows the people rising up and waging war against police authorities, something that is perfectly applicable to Vietnam’s current situation. Citizens of Vietnam are subjected to cruel and violent treatment by the Communist police 24/7, and are no strangers to police brutality. In Vietnam’s police state, the authorities reign supreme over the population. They terrorize the population for their own benefits, and they do so with impunity. To this day, the people of Vietnam remain subjugated by the Communist Party, who tightly monitor and control their lives. For these reasons, I find the images in Kanye’s video quite exhilarating. One some days, I just want to see it happen to the Communist police in Vietnam. What I like about “No Church In The Wild” is the raw emotion and sheer intensity evoked by its imagery. I am not bothered that this song really has nothing to do with Communism or the nation of Vietnam. The only thing I want to share is the footage of the people rising up and resisting repressive government authorities. Kanye West and Jay-Z may be rapping about something else, but that is perfectly fine here. As long as this message is delivered, my goal is met. Enjoy the video, people. Remember, use your imagination. Editor’s Note: I’m sure many of you already know, but it is important that I address it. This video is shared strictly for your entertainment, and should not be perceived as a swift change in attitude from this blogger or any of my associates. I am, first and foremost, an advocate of non-violence and peaceful, yet forceful self-expression. I promote progress through knowledge, courage, and unity, and not through the unjust use of force (which the Communist police are guilty of). Violence should only be considered as a last resort, when all other options are out of reach. Furthermore, I do not share the views expressed in the lyrics of Kanye West and Jay-Z. I do not preach anti-religious sentiments, nor do I care whether Jay-Z and Kanye are part of the Illuminati or not. Frankly, my dear readers, I could care less what Jay-Z and Kanye’s religious views are or what they claim (remember, Kanye West did write “Jesus Walks”). I do recognize that I said I hope this happens to the police in Vietnam sometimes, but that does not reflect my overall vision for moving Vietnam forward. That statement is just my way of expressing my disdain for the Communist police, and that they do deserve to get some sense beaten into them (don’t you agree?). If you haven’t noticed, this latest article is mostly satire at the expense of the Communist police, and also a little bit at Jay-Z and Kanye West. As always, I appreciate your feedback and opinions, and look forward to hearing more from you all, in this post or the next. Dear readers, cheers! 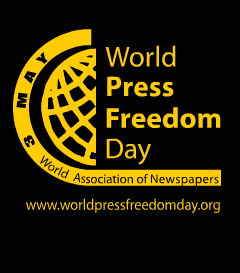 Over one month ago, on May 3, 2012, a world celebration known as World Press Freedom Day was held in Carthage, Tunisia. 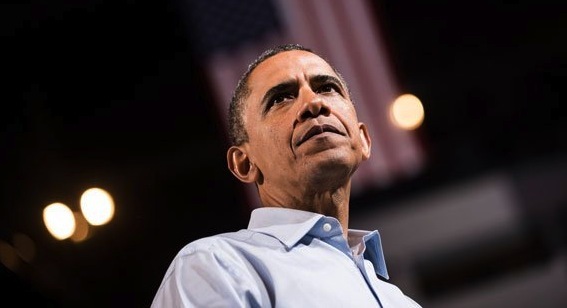 Many world leaders delivered messages of celebration and commemoration that day, including President Barack Obama. The President included many prominent names in his statements. One of which was Dieu Cay, a well known democracy activist imprisoned by the Vietnamese government since 2008. Dieu Cay is the pen name for Vietnamese blogger and freedom activist Nguyen Van Hai. He has been detained by the Communist government in Vietnam since 2008 for protesting China’s actions in Tibet, the Spratly Islands, and criticizing the country’s Olympic torch relay. Idiotically, yet unsurprisingly, the Vietnamese government imprisoned Dieu Cay under the charges “tax evasion”, which is bogus to say the least. Following his release in 2010, Dieu Cay continued to express his opinions on his blog, before being harassed and imprisoned by the Communist Police once again. To this day, blogger Nguyen “Dieu Cay” Van Hai is still serving time in Vietnamese jail for charges of “conducting propaganda against the state”. He is currently facing a possible 20 years in prison, unless he pleads guilty to the bogus charges and concedes to the Communists. International pressure on the Vietnamese government may help reduce this sentence, as Dieu Cay refuses to plead guilty. It is a wonder what caught the attention of President Obama to Vietnam’s current human rights situation. Though it is true that he was aware of the matter, he had yet to publicly speak out in defense of a single dissident, until May 3, that is. One very viable possibility, is the recent surge of information and momentum made possible by Mr. Truc Ho, the White House petition, and the music of Viet Khang. We have said in the past that the president listens, now we know that he listens. Not only does the president listen however, but he also speaks. Whether you recognize it or not, President Obama wants the votes of Vietnamese Americans, and is now starting to reach out to the Vietnamese community in the U.S. As members of a proud and democratic nation, we can help foster this movement by exercising our democratic rights. It’s election season, people. Let’s show the candidates that we got the vote. This past Sunday, U.S. Secretary of Defense, Leon Panetta paid a visit to Vietnam’s Cam Ranh Bay, a major U.S. base used during the Vietnam War. The visit yielded agreements between the U.S. and Vietnam to open restricted military sites in Vietnam that would permit searches for MIA soldiers of the war. Behind these agreements however, is the continuation of a deeper goal, the further normalization of relations between two former enemies. 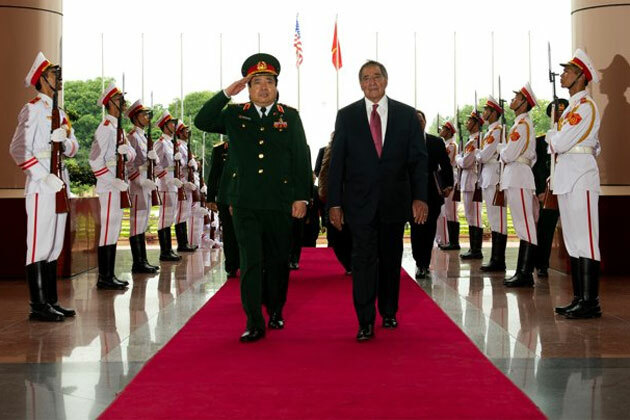 As of today, Panetta is the most senior American official to visit Cam Ranh Bay. Not only does this visit signify the developing ties between the two sides, it also signifies America’s national interests in Vietnam as a key player in the Southeast Asia Sea. According to American analysts, Vietnam currently holds a decisive role in shaping the balance of power in the Southeast Asia Sea. The Center for a New American Security professes that Vietnam is arguably the pivotal player, or “swing-state” for what happens in the sea. If Vietnam fails to step up to an increasingly assertive China, smaller countries like the Philippines have little chance of resisting. 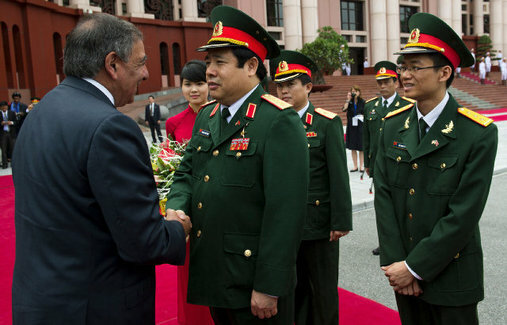 These insights paint a vivid picture of Vietnam’s potential in dealing with Chinese hegemony. Of the many countries in Asia at this point in time, Vietnam remains the key obstacle against Chinese expansionism. As a result, the U.S. continues to pursue better relations with the country. Unfortunately, these warming relations comes at the cost of human rights in Vietnam. To keep Vietnam from running into the arms of the Chinese, the United States must turn a blind eye to the atrocious human rights record of Vietnam. This is the American dilemma. In order to keep U.S.-Vietnam relations on the right track, the United States is forced to soften its stance on human rights. Nonetheless, this reality outlines the importance of Vietnam’s role in dealing with Chinese hegemony in the South China Sea. Vietnam can very well be the difference maker in China’s success or failure in this territorial dispute, and has the power to counter China’s influence in Southeast Asia. America understands this, and Vietnam understands this. This is one major reason why the two countries have become so close in recent years, with an increasingly nervous and aggressive China on the periphery. Though the human rights abuses continue to cause friction between Vietnam and the U.S., the China issue continues to bring the two closer together.